It was only a month ago that Jenni "JWoww" Farley revealed her son's autism diagnosis. He has a major speech delay. If you watch JWoww's video, which we have included, you'll see that he has made some astounding personal progress in a very short time. Take a look and see little Greyson's powerful journey. Jenni "JWoww" Harley shared some news with her fans in November. Greyson Valor, she revealed, was "non-verbal." He is autistic, and not all autistic people speak. He has since made great strides, for which she is immensely thankful. In a tribute video that she posted, she shows her son's progress. The dramatic results show how quickly a young child can change in a very short time, especially with speech therapist. What once had JWoww fearing that Greyson would never speak is now a speech delay. The vast majority of two-year-old children are happily speaking and living their best lives. Greyson took until he was a little older than two to show that he recognized his own name. 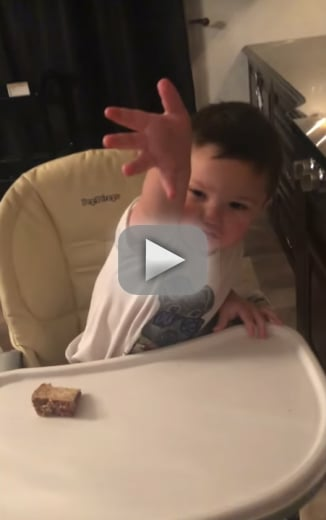 JWoww's video begins with Greyson responding very little or not at all to auditory input. His mother calls his name, and he does not seem aware of it. In another scene, he asks for food from his mother, but is unable to verbalize his request. Greyson hit some developmental milestones a little later than Jwoww had hoped. It's not that children on the autistic spectrum are necessarily less intelligent than neurotypical children in their age group. Instead, it's because autism — which is very complicated and comes in many forms — means that his mind processes things differently. The best analogy that comes to mind is traffic. If 90% of people take one route, someone who takes a very different route will arrive at a different time. Speech is complicated, and at times he might be too overwhelmed by other experiences to process what he's hearing, let alone what he is saying. But while some autistic folks remain nonverbal for life, that is not the case with Greyson. As the video reveals, Greyson has made great strides this year in terms of verbal communication. With a little prompting from his mother, Greyson blows a kiss with a very loud verbal "mwah!" In the same clip, in which he is seated in his car seat, he says "hi!" Then, we see Greyson chattering on his own. Many (very loving, very devoted) parents know how exhausting it can be to hear little children who speak nonstop. But to a parent who had feared just months earlier that their child would never speak at all, hearing him jabber feels like a miracle. Of course, rambling without being very intelligible is a far cry from actually speaking. But as we already knew, Greyson has been developing his vocabulary. JWoww's videos include the one that we shared in early December. Greyson, dressed as Dash from The Incredibles, repeats the names of colors on command. Some parents might not be blown away by a video of a child old enough to walk who is parroting their parents' words. But for Greyson, it shows that he doesn't just understand the words — he can also repeat them verbally and intelligibly. This is huge for him and very encouraging to those who love him. Greyson is autistic, and that is part of who he is. There is no "cure" for autism, only therapies to help them thrive in a neurotypical society. As an adult, he may never fully understand when it is and is not his turn to speak. Or, he may be uncomfortable making eye contact with people, especially while talking to them. But he may also be fine with both of those things. Some autistic folks go their entire lives without being diagnosed, and were just seen as "quirky" or "slow" or "awkward" as children. Everybody's a little different, and it's inspiring to see that JWoww has hope for her son's future. Tarek & Christina El Moussa: Has Divorce Been Good For Their Careers? Previous story Offset to Cardi B: Take My Giant Shlong! And Also These Gifts!